Books made into Movies is the next topic in the monthly Poppins Book Nook virtual book club. 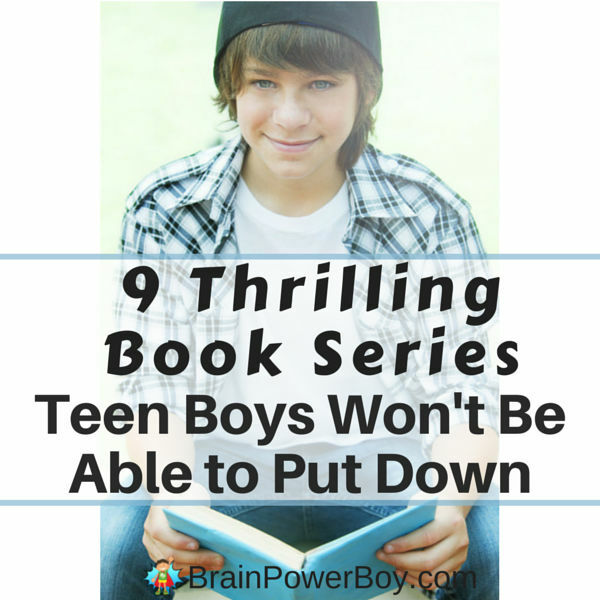 So we set out to find the best books for boys that have been turned into movies. 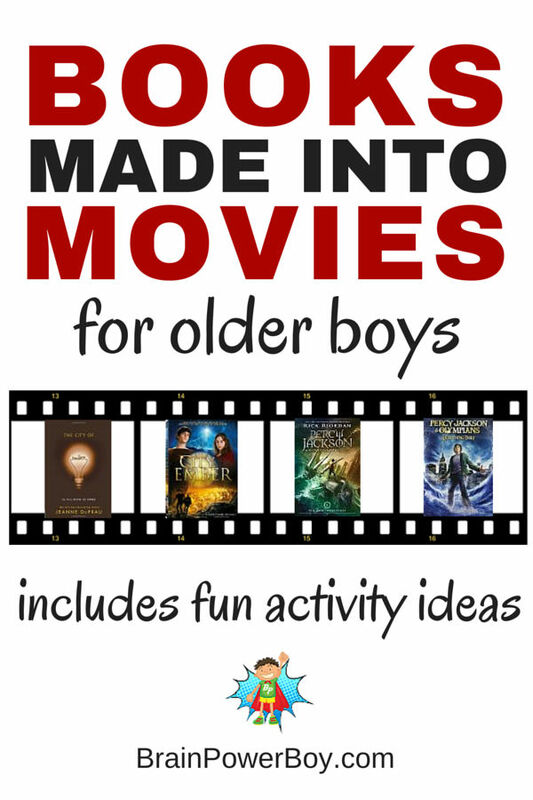 We all know about Charlie and the Chocolate Factory, The Jungle Book and Peter Pan but I wanted to highlight some movies that might entice older boys to pick up a book. Whether they read the book first or get interested in the book because of the movie these movie-book pairs are always entertaining. Take a look at our choices and feel free to comment with your favorites as well. Be sure to scroll to the end to see some fun activity ideas. The City of Ember is full of adventure and excitement. The city is losing power and two teens are determined to escape – before it is too late. The Lightning Thief was super popular with boys. Many a boy stayed up late to finish this book and they couldn’t wait to read the next book in the series. Get ready for a boy who finds out he is a demi-god and a whole lot of greek mythology in a great story line. Oh and his father just happens to be Poseidon! An orphan, a clock keeper, a thief, Hugo is the intriguing main character in The Invention of Hugo Cabret . This is an incredible book to read. The illustrations are absolutely amazing! We have not yet seen the movie so feel free to leave a comment below letting us know if it was good. Harry Potter and the Sorcerer’s Stone begins a series that has kept my son engaged and reading books cover to cover one after another. Then came the movies. A young orphaned boy named Harry, wizards, owls, dragons, a school unlike any other. Oh, the Harry Potter books and movies have it all. This book was written by a teenage homeschool boy! Gotta love that he wrote this book, his family self-published, it got picked up by a big publisher and made into a movie. Eragon is a story of a 15-year-old farm boy who finds a stone which turns out to be a dragon egg. We love dragon stories! They say the movie isn’t as good as the book. I say, of course not, they never are! The Maze Runner will keep you on your toes. Consider what it would be like to be stuck in an ever-changing maze! Getting through a maze is hard enough but a maze that is always changing? Tough indeed. Fast-paced action is a good way to describe this book/movie combo. If your boy likes intrigue and spy thrillers try this one. Stormbreaker features 14-year-old Alex Rider who’s uncle has died a mysterious death and it ends up that the uncle wasn’t the bank VP he told Alex he was. Instead he was a spy for the British government. Act out a scene from the movie and the same scene from the book. Ask your kids to figure out if the characters and dialogue are the same or different. What lines are similar. Which lines actually give different meaning to the whole scene? Draw and talk about the differences in personal appearance between the movie characters and the illustrated book characters. Is their hair color even the same? Does the character described in the book make it into the movie or is the movie character a big departure from the description given? Draw a picture of what you think they character should look like based on the author’s description and/or based on your own opinion of how they should look. List out obvious and not so obvious differences between the book and the movie. We are sometimes amazed at how a director will choose to leave out a rather important character or change a character so much that we hardly recognize them. Make a stop-motion animation in LEGO (or other style) of your favorite scene from the book or the movie. These are so much fun to do and they really make you consider all the details that go into movie making. Get Cooking! See if you can find some recipes to cook from the book/movie pair. Try our Geek Cookbooks for a few ideas or google [“book title” recipes] for more. If you can’t find anything specific, you can simply make any of the foods mentioned in the book or movie. This is always fun to do in combination with a family movie night. I hope you enjoy the books made into movies list and try some of the fun activities too. We sure enjoyed picking out some winning combinations for you. Try this reading list for additional book ideas for older boys! This is such a fun post! I love your list. My son will, too!! Thank you, thank you, for this great list! My pleasure Erin, so happy to have you stop by and take a look. Thank you for stopping by the Thoughtful Spot Weekly Blog Hop and sharing this fun list with all of us! Have a wonderful weekend and I hope to see you on Monday again!